Climbing Nightshade, Solanum dulcamara L.
Climbing Nightshade is a perennial introduced vine without tendrils that grows near other plants for support and can reach many feet in length. Stems are purple color when new, then turning a greenish-brown; some with fine hair initially, older parts are woody. The leaves are alternate, stalked, about 2x as long as wide, simple, but usually deeply lobed near the base forming two distinct lower lobes and sometimes four. The part of the leaf stalk nearest the base of the leaf has a small wing. The terminal lobe is the largest and broadest. The leaves face the sunlight and the flower clusters face a different direction. The inflorescence is an open branched cluster that arises opposite a leaf at a stem node. This is different from Black Nightshade where the cluster arises between the leaf nodes. The ends of the stem with the branched flower clusters are usually self supporting. 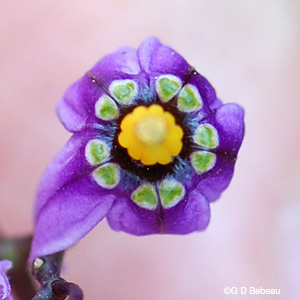 The flowers are no more than 1/2 inch wide, blue to purple/violet, 5-part and the lobes of the purple corolla unfold and curve backwards uncovering the five yellow anthers which are united and form a cone around the pistil, resembling the Shooting Star flower. A single style extends beyond the anthers. There are yellow to greenish spots at the base of the corolla inside. the cluster stalks and the flower buds are also purple/violet. The calyx of the flower is usually purple, but can be greenish. It has 5 rounded lobes which are persistent on the base of the berry that forms. The fruit is a small 1/4 inch berry, turning from green to a brilliant red. Berries are produced throughout the growing season and in the fall the red berries are often remaining long after the leaves have dropped. 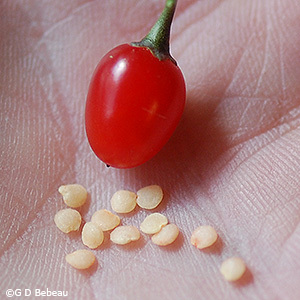 Each berry contains up to 12 yellow oval beaked seeds, 2 mm to 2.5 mm long. Toxic: The foliage is toxic to many people and should be handled with care. The fruit is said to also be toxic, particularly to children. 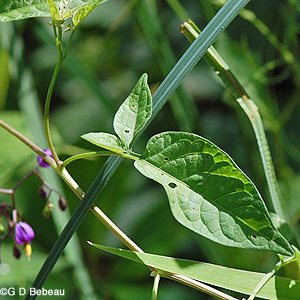 Habitat: Climbing Nightshade grows from rhizomes and adapts well to many soil conditions and is difficult to eliminate as a small section of the rhizome left in the ground will generate a new plant. The root system is not a dense mass but spreads far. It grows best in full sun and moist to mesic conditions. You will fine it in marshes, woods, disturbed sites. 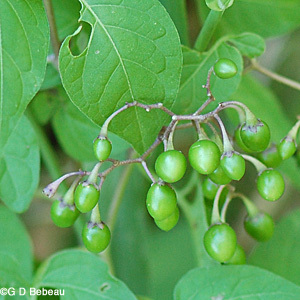 Names: The alternate common name of Bittersweet Nightshade comes from the leaves and root, which when crushed have a sweet followed by a bitter taste. The genus name Solanum comes from the Latin Solor, meaning "I ease" referring to the somewhat narcotic power of some folk medicines created from the plant. The species name, dulcamara, according to Mrs. Grieve (Ref.#7) is derived from a word meaning Bittersweet that was used in the Middle Ages and written Amaradulcis and has been corrupted to dulcamara. The author name for the plant classification - 'L.' is for Carl Linnaeus (1707-1778), Swedish botanist and the developer of the binomial nomenclature of modern taxonomy. As to the other common names, 'Dulcamara' is explained above. 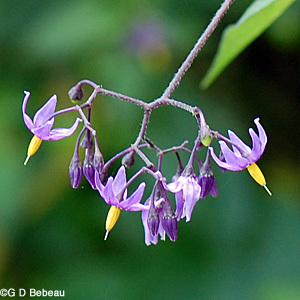 'Wood Nightshade' was used by old herbalists to distinguish the plant from Belladonna (Deadly Nightshade). As to Felonwood, Mrs. Grieve (Ref. #7) states that that it is probably derived from Felonwort - a plant for treating felons (as explained in the medicinal section at the page bottom). Felon is an old name referring to an abcess of the soft tissue near a fingernail or toenail. A felon was later called a 'whitlow'. Comparisons: Another nightshade to be encountered is Black Nightshade, Solanum nigrum L., which tends to grow in similar areas but has flowers with a whitish corolla where the petals spread but do not reflex and the berries turn black at maturity. 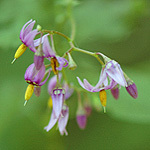 Above: The Shooting Star like flowers form once the parts of the corolla fold backward revealing the yellow of the anthers. Note the stalks and stem of the flower cluster are also purple and the greenish-yellow spots at the base of the petals. Below: 1st photo - Detail of the greenish-yellow spots at the base of the petals. 2nd photo - A three-lobe leaflet. Many times the upper section does not separate and the leaf appears as a single deep-lobed leaf. 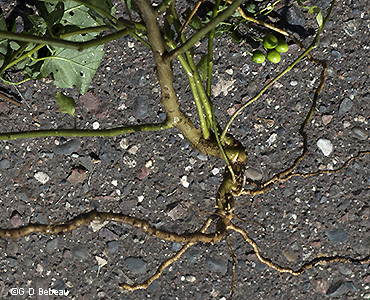 Below: 1st photo - The rhizomatous root system is not dense but roots spread far and wide underground. The bark of the larger roots is used medicinally. Above and Below - Fruit development: The fruit develops from the initial green to yellow to orange and finally to brilliant red (all colors shown in the photo below). The calyx of the flower is persistent on the top of the berry. Each berry contains up to 12 2mm to 2.5mm long yellow seeds. Notes: Eloise Butler's records show that she first brought in this species on Oct. 4, 1914 when she planted a root from Mrs. Healy's garden (1800 Humbolt Ave, Minneapolis). Garden sources were popular for this plant as on Aug. 28, 1917 she obtained another from 'a friend's garden', then on June 16, 1919 and on April 24, 1921 from Babcock's yard at 227 Xerxes Ave North in Minneapolis. She boarded with the Babcocks from 1916 onward during the Garden season as their property was adjacent to Glenwood Park, the original name of the area. 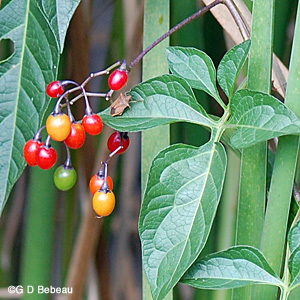 Common throughout Minnesota but originally a Eurasian plant, Climbing Nightshade has now naturalized in the all the United States except some states of the deep South, and it is also found in most of the lower Canadian Provinces. The U of M reports There 7 species of Solanum in Minnesota, one of which is the common potato, but the DNR only lists 5 on their county survey data. Two other species of the Nightshade Family are found in the Garden - Black Nightshade and Clammy Groundcherry. Medicinal History: There is a long medicinal history for this plant going back to Galen in 150 CE. The medicinal parts are the bark of the root and the twigs and sometimes the leaves. 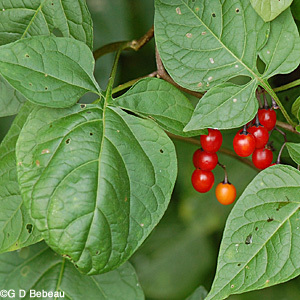 The plant must not be confused with Belladonna, or Deadly Nightshade (Atropa bella-donna L.), which however, is quite restricted in distribution in the United States - and not known in Minnesota. Externally an ointment was made for skin diseases. Internally, a tincture was prepared to treat problems requiring a diaphoretic or a diuretic. Large doses would produce vomiting and could lead to respiratory paralysis. In Russia a home medicine developed using a few drops of tincture in vodka for treatment of a weak heart. Dried leaves can also be used to create a tincture. 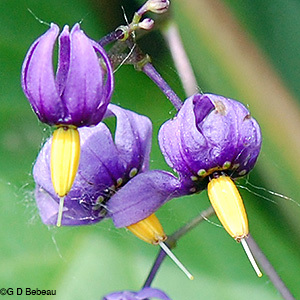 All members of the Nightshade family have a narcotic property, which is why some of them are highly poisonous. However, this plant family also includes the tomato and the potato. The narcotic property is the alkaloid Solanine; in addition, the plant has the glucoside Dulcamarine. These drugs were formerly useful in treating skin diseases, especially skin eruptions. The plant was listed in the British Pharmacopoeia until 1907. European shepherds would put a necklace of the plant around the necks of their animals that were suspected of being under the "evil eye". See Hutchins (Ref. #12) and Grieve (Ref. #7) for more details.